CHRISTIANITY AND THE WAY YOU VIEW THE BIBLE, FOREVER! The Impossible is Now Possible"... 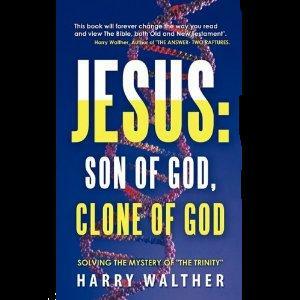 The new book by HARRY WALTHER, "JESUS, SON OF GOD, CLONE OF GOD" is the most important and relevant Theology Book since The Gospel was first written. Now the Mystery and Puzzle over "THE TRINITY" is solved as you can know exactly who JESUS is, "THE SON OF GOD, THE CLONE OF GOD". EXISTANCE" BEFORE THE CREATION OF THE WORLD. A MAN TO DIE FOR THE SINS OF THE WORLD. KEEPING YOU FROM THE TRUE POWER OF GOD. The Church that will ESCAPE 666, The Coming Apocalypse, in The First of Two Rapture Events. (Lu:21:34-36 = Mt:24:40-44 = Rev:3:10, to The "Church of Philadelphia"). Two earlier books by HARRY WALTHER that solve two other mysteries, That of The Rapture of The Church (i.e. Two Raptures) and the Name and Identity of Antichrist. 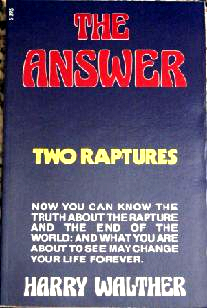 "The Answer - Two Raptures" by Harry Walther The Most Banned Book in America solves the mystery and controversy over The Rapture, proving there are Two Raptures and how we can be ready to "Escape" The Coming Apocalypse, The Reign of Antichrist. A must read in these "End Times". This book is only available for purchase on this web site via Paypall or Money Order. Click on the image to purchase. Thank you. 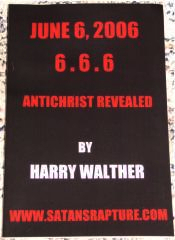 "JUNE 6 2006, (666) ANTICHRIST REVEALED" by Harry Walther shows you for the first time in History, the Name and Identity of Antichrist. Also explored are, Could Antichrist Be The Product of Human Cloning? Will He Come In A Spaceship? Could Antichrist be the true Son of Satan and the "Lost Book of Cain". Included in this book is "THE LOST BOOK OF CAIN". Come Face to face with Pure Evil in what could be the oldest written manuscript in existance today and possibly the "secret" book of Luciferic and Satanic Societies. All proceeds from these book sales go to help sponsor our live, internet radio show, Doomsday Talk Radio.